It’s Orlando, Fl at 3am on a Sunday morning and more than 50 people have been mowed down from an active shooter situation. The location was a gun free zone set by some liberal pansy who believed that would stop someone had bad intentions and armed with a gun. They were dead wrong. Only if someone who was armed was able to be there he might have saved many lives that night. Active shooter situations are continuing to increase because there is an increase in “gun free zones.” As a prepper it is our responsibility to be prepared and ready for the fight. These situations can really happen anywhere. Now I don’t encourage you to go looking for active shooter situations. That should be left up for people who are there and police officers. However, if you find yourself in that situation it is your responsibility to not only protect yourself but also the ones you love and the innocent people around. If you would prefer to run and not care about the innocent lives then I need you to stop and find some other blog to read. There are two levels of gear that we should either be carrying on us at all times or relatively close for easy access. The first of course is your everyday carry gear. The other would be a active shooter response kit. Let me be clear, when you are caught in an active shooter situation you will have to fight with what you have on. You will not have time to rush back to your car to get a bag. By then many people will have already died. However, if you are close to or in your car during this active shooter situation then it would be beneficial to have this bag ready to go. 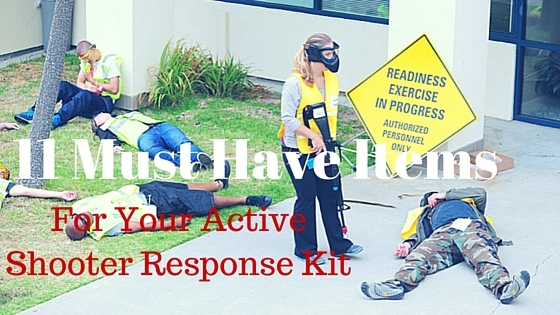 So let me go over the items of active shooter response gear that I believe you should have. Now I’m clearly not an expert or tactical trainer. These are just my suggestions. It doesn’t take a rocket scientist or mathematician to understand that you will not have much luck fighting against someone with a semi auto rifle by using a hand gun. However, since you can’t conceal carry an AR-15 in your pants then you will have to settle for a hand gun. Every prepper should have their P.A.C.E. (Primary, Alternative, Contingency and Emergency) gear setup ready. Your primary will have to be a handgun unless you can make your way to your alternative weapon which should be a semi-auto rifle (preferably). That handgun should have a long magazine when gun fighting against a rifle. So I would recommend the Glock 17 as it comes with a 17 round magazine. This will buy you some time until you can either get the kill shot or find an alternative. Following up with the previous point the handgun should be able to feed with an extended magazine. Again the Glock 17 can also be fed with the extended magazine. You can find an inside the waistband holster that will hold that extra magazine. You will want a high quality holster from which you can quickly grab the handgun without snagging or getting stuck. I wouldn’t recommend leather holsters as sometimes they can retain moisture from your sweat and even humidity. This will affect your grip when pulling your hand gun. My current holster is an IWB Alien Gear Kydex Holster. They have a great reputation for providing high quality holsters. A normal leather built is not ideal for concealed carry. Normal leather belts tend to bend and when too much weight is being carried in your pockets it will pull your pants down. This will hinder your movement in a highly stressful situation. Normal leather belts also tend to break when too much pressure is applied. That is the last thing you need in an active shooter situation. There are a few options when considering gun belts. The first is the traditional belt buckle style leather belt that you can find from Hanks Gunner or Relentless Tactical. With these belts you have to make sure you are getting the correct size because with an IWB holster it is going to knock you up a couple of sizes. However, this will help you to be the grey man and not alert anyone that you are wearing anything tactical. They have both black and brown color styles. Another great option is a Cobra Buckle belt through Elite Survival Systems. Now these belts are not the traditional leather belt material but rather constructed with mil-spec nylon webbing. They are extremely stiff and will not bend as easily as leather belts after much wear. The Cobra Buckles are incredible as they are able to withstand 4000 to 5000 pounds of pressure. So the buckle is not going to break off unlike the typical buckles found on leather belts. One final option is the Trakline X2 Gun Buckle Belt. Trakline X2’s stiffness is comparable to a Hanks Gunner belt. With the belt buckle you don’t have to worry about buying the right size as it is a ratchet belt. So it can easily adjust in ¼ inch increments to the size that you need it for any situation that you may be in. The problem with other belts is that the holes are not always the perfect size. Sometimes they are either too tight or too loose. It also doesn’t have a tactical appearance. 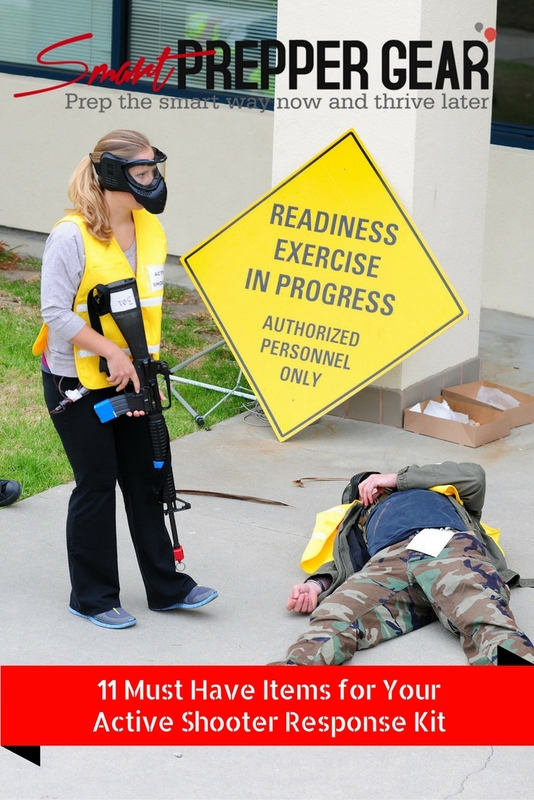 In an active shooter situation you won’t have much time to line up a perfect shot. If the sun is glaring or reflecting off of glass then it will affect your aim. Polarized sunglasses are miracle workers. I will never go back to wearing non-polarized sunglasses again. You will also want sunglasses that are made for those that are active like sporting glasses or even gun range glasses. In an active shooter situation you will be moving around a lot. You can’t afford having your glasses fall of your face or have to be constantly adjusting them in order to see. You can wear these types of sunglasses without sticking out like a sore thumb. The pair that I wear are the Wiley X Censor Ops. They are almost identical to Oakley’s so it doesn’t appear that you are wearing something tactical. On top of being polarized they are also military ballistic grade. So they are great for wearing at the shooting range. In either case they will provide high velocity protection. If you are caught in an active shooter situation then there is a high probability that you are going to get hurt. There may not be someone there that can bandage you up because they may be dead or injured themselves. So carrying a small tourniquet like the TK 4 can give you the ability to patch yourself up until help has arrived. With an active shooter bag you will want something light weight and give you quick access to what you need. You will want direct access to extra magazines, spare weapons and even first aid kits. There are really great options on the market such as the Maxpedition Active Shooter bag or the 5.11 Bail Out Bag. If it is lawful in your state then I would recommend keeping a semi-automatic rifle in the trunk of your car along with your active shooter kit. Like I said you are going to fight the active shooter with what you have on you. However, if you are close to your car or in it you can quickly access the rifle. Yes, you should have a small tourniquet in your EDC but you will also want a bigger first aid kit with some gloves so that you can help any victims after the threat has been eliminated. The emergency doesn’t end after his or her body hits the grounds. You will have victims that will need to be treated until medics can arrive on the scene. Medics are not allowed on the scene until the area has been cleared by law enforcement which typically takes about 10 to 15 minutes to arrive on scene at the earliest. Then it will take more time to clear the scene. In your active shooter response bag you should have an armor plate inside. This will give you the option to whip the bag around to your front to cover your chest while potentially battling with the active shooter. You will not have time to put on a rig. It will be quicker just to grab the bag. When officers arrive on seen they will demand that you drop your weapon. Comply! Once the scene has been cleared you will want to hand them the card that USCCA provides you to ask for your attorney. Don’t answer any questions until your legal council is there. Yes, you may consider yourself a hero but there will still be an investigation. Sadly legal CCW owners have been subject to charges and even lawsuits after lawfully putting down an active shooter, robber and even an intruder. USCCA is legal insurance just like we have car insurance. We may never get into an accident but it is great to have that insurance when you do. Lawyers are not cheap especially when it comes to shootings.